At a meeting held July 27, 2018, Toronto City Council approved a new bylaw to regulate residential construction dust. Toronto Municipal Code Chapter 417, Dust applies to residential construction, including decorative stonework, retaining walls, and walkways. It does not include multi-residential construction. The Good Neighbour Guide – this guide is available to download online. It has been made available in a number of languages, including Farsi, French, Korean, and Russian, as well as in both Simplified Chinese (Mandarin) and Traditional Chinese (Cantonese). 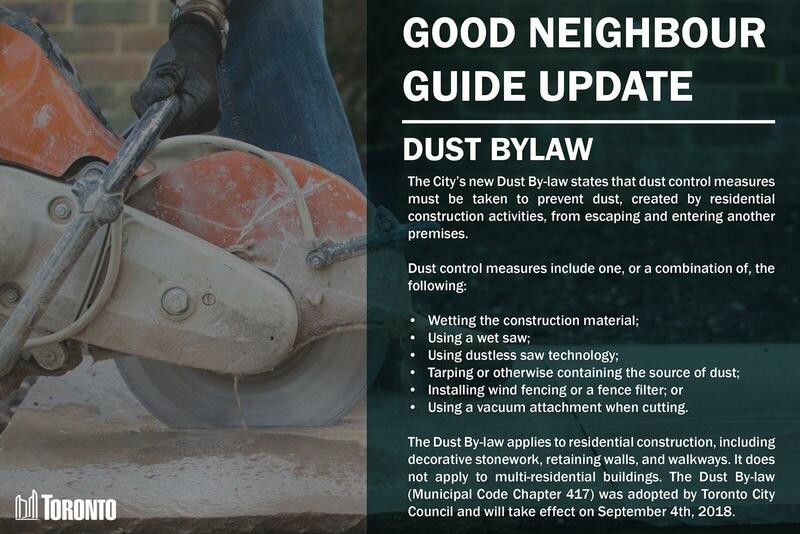 Dust Bylaw Update – this provides a high-level overview of the new bylaw for residential construction dust. 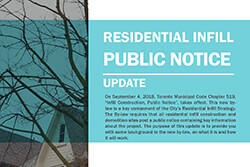 Residential Infill Update – this provides an overview of the new public notice requirements required under Chapter 519, Infill Construction, Public Notice (link to bylaw). Both Chapter 417, Dust and Chapter 519, Infill Construction, Public Notice take effect on Sept. 4, 2018. They are part of the Residential Infill Strategy. The Residential Infill Strategy is a comprehensive city-wide initiative established to proactively address issues associated with construction and demolition of residential buildings in Toronto’s neighbourhoods. More information on the strategy can be found at www.toronto.ca/infill.